Aaron Burns. Pic by Pacemaker. Glenavon manager Gary Hamilton has dismissed speculation over a deal for Linfield’s Aaron Burns. Burns recently confirmed Linfield’s decision not to offer him a fresh contract beyond this season - leading to links with a range of rival Irish League clubs, including Glenavon. However, Hamilton is keen to address the rumours and rule out the Mourneview Park club from opening talks. “We have not been speaking to Aaron and will not be getting in contact,” said Hamilton. “Aaron is a very good player and we did discuss a move maybe two years back but his demands at the time proved beyond our budget. “With that in mind, it would put us off going back as we do not waste time chasing unrealistic targets. “We were nowhere near want Aaron wanted in the past so, unless he made contact with us looking a reduced deal, that situation will remain the same. 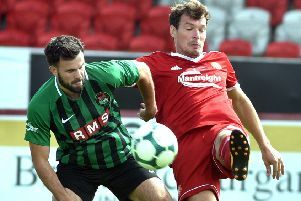 Negotiations behind the scenes proved a constant part of the Irish League dialogue but Hamilton wants to stamp out the Burns rumour within his club’s fanbase. “I don’t like the idea of Glenavon’s name being used as a bargaining tool,” said Hamilton. “We are in the market for ways to improve the quality of the squad and that comes down to individuals rather than any specific area. “If a player can tick every box we look for in a potential signing then we will move forward in this window but the aim is always to go about our business in a quiet manner. “It is the way we like to operate and also the fact is, given our budget, if word gets out about targets there is always a risk of another club coming in and snapping up a player with a better package.